Curtis is a semi-retired photographer/videographer that has had a long time interest in orchids. After dabbling in hybrid roses, he was introduced to orchids in 1970 because of his need to use some plants and flowers in a photo shoot. The gentleman that provided his introduction was Homer C. Dodson, who later became his mentor. Homer invited Curtis to attend with him a meeting of the local orchid society where he bought some raffle tickets and won two plants. One of those plants, Den. Petite Jewels [Midnight x bigibbum], is still alive and doing well. Needless to say, Curtis was hooked and has had a wonderful time, over the past 46 years, studying species and their cultural requirements, researching hybrids, and even learning to be an orchid judge. He entered the AOS Judges Training Program in 1973 and was elevated to Certified Judge in 1983. In 1996, following the break-up of his marriage, Curtis moved to Mexico, where he spent the better part of the next 10 years learning how to survive on next-to nothing. It was a real challenge, but he believes he became a better person as a result of it. In 2007, Curtis returned stateside to care for aging parents, and re-entered the AOS Judging Program. Because of his long absence, Curtis was required to “start over” and was re-certified in 2013. Orchiditis is a compelling and insidious disease that takes over your life if you let it, and it becomes all-consuming as several of our POS members can attest to. Curtis loves it, and every day he finds something new to explore. While in Mexico, Curtis had the chance to look for orchids in the states of Nayarit, Jalisco, Colima, Michoacan, and Guerrero. 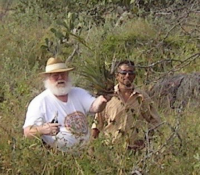 He was able to find numerous epiphytes and semi-terrestrial species, and because of some established contacts there, he was given the opportunity to re-locate many plants slated for destruction. Because of road improvement projects and the like, many plants would have been destroyed, but were able to be re-located to a nearby area and saved as a result of his conservation efforts.